A Catamaran Cruise with Seven days of Catamaran sailing. 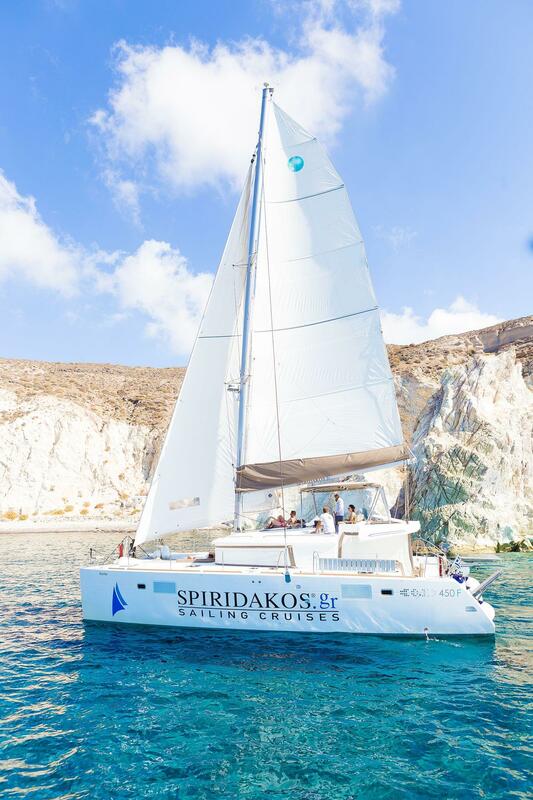 Sail from Santorini Island aboard this 7 day Catamaran Cruise. Explore the Southern Cyclades islands of Ios, Naxos, Paros and Mykonos. Sail past the Red and White beaches and the Caldera Coastline. Swim at the Hot Springs, sail past Oia and Thirassia island and visit all picturesque locations Santorini is famous for. Similarly, sail to Ios and swim at Maganari, one of the most acclaimed beaches of Ios and Cyclades alike, known for its crystal blue waters and its golden sand. Later explore the island before embarking at the port. Disembark and discover Ios’ nightlife and walk its traditional alleys. Explore the traditional villages of Skaros and Palaiokastro and the Archaeological Museum of Ios. The following day we sail towards Naxos, an island of archaeological interest with many traditional villages as well as rich history. Its intriguing local cheese production as well as the famous Naxian Marbles capture even the most demanding personalities. Lastly, swim at Agios Prokopios Beach and walk through the nice alleys of the island before setting sail for Paros. Our third Catamaran Cruise day in this multi day trip includes the island of Paros. A Cycladic island known for its traditional windmills, marble quarries and monasteries alike that date back to the Middle Ages. Paros’s capital is Naousa, a city of long history that still keeps Paros as a top destination in the Aegean Sea. Our final Sailing Cruise stop is at Mykonos. Most noteworthy, Mykonos is known for its Cycladic architecture and nightlife alike. Additionally, its glamorous mykonian nightlife, traditional villages and charming alleys can be combined with shopping at the city center. Swim at the best beaches of the island, Psarrou and Elia. Embrace the mykonian culture and walk through its unique pedestrians. -Transfer to and from your pickup location with A/C Minibus. -Towels, Snorkeling and Safety equipment onboard. -Fuel cost and taxes for the cruise are included. -Accommodation inside the cabins with private bathrooms. -Breakfast and One Meal per day onboard.